"Chas. 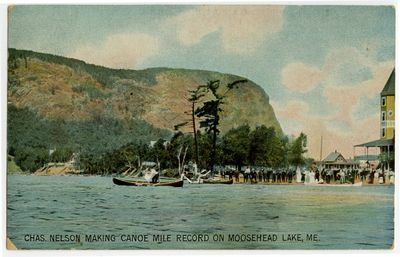 Nelson Making Canoe Mile Record on Moosehead Lake, Maine "
Charles Nelson makes the canoe mile record at Moosehead Lake, Maine. Published by Hugh C. Leighton Manufacturers, Portand, Maine. The postmark on the back is dated August 16, 1908.